Poetry has always been a force in my life, from a fairly early age. I remember being smitten by the poem “American Rhapsody (4)” by Kenneth Fearing in 8th grade, turning to the back of our anthology over and over again. When the teacher rather listlessly asked for volunteers to read it aloud one June day, my arm flung up so fast that I felt a twinge in my shoulder for the entire afternoon. Poetry, too, was how my husband first courted me (well, that and comic books, but that’s another story). We would sit for hours, exchanging verse from my family’s old, tattered anthology. And we imposed our affection of all things poetic on our boys – instituting a daily rule that they needed to find or write a poem to read before dinner every evening. It’s remarkable that we didn’t scar them for life. Poetry, too, brought me back to writing after a long hiatus. I started with those required evenings, composing doggerel to make the boys laugh, and slowly becoming more serious. Poems were among my first published work. So why don’t I write it now? I have tried. But something in me forbids the mix of genres and I find the effort needed for novel writing subsumes me totally. But that doesn’t mean I don’t use the lessons I learned in composing verse in my fiction – finding the exact word, employing compression of language (especially during revision), stretching to compose metaphors that linger in the reader’s mind long after they’ve closed the book. 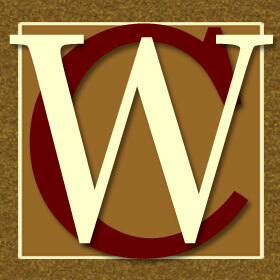 And every April, I trot out my love affair with poetry, displaying it boldly in my classrooms. Even when the kids groan at the idea, I watch them magically change their minds and grow excited at the sounds and rhythms they themselves produce. Perhaps my excitement even sways a few of them to approach poetry differently. 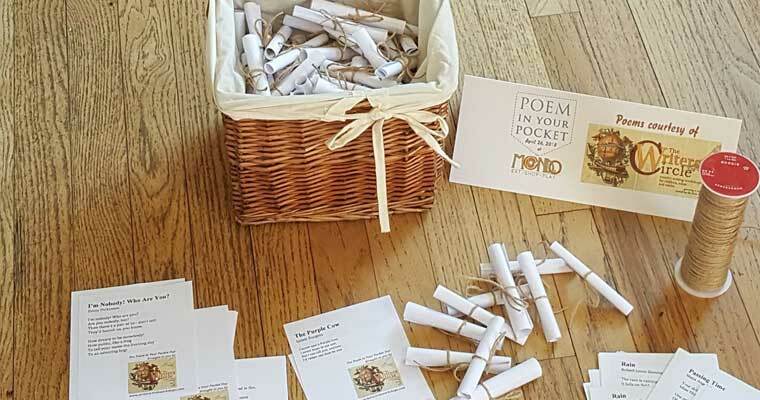 So when Annette Dwyer of MONDO Summit suggested using the unofficial holidays of each month as a way for her tenants to promote their products and services, I instantly knew I wanted The Writers Circle to take advantage of Poem in Your Pocket Day. Taking place every April during National Poetry Month, this day was initiated by the Academy of American Poets, which organizes activities for schools and other organizations to bring poetry to the people. Believe me, I recognize finding short, accessible poems to print out and roll into dozens of small cylinders, tying them like little gifts, as the odd effort that it was. And yet, with every tiny roll of paper, my hope – like Emily Dickinson’s “’Hope’ is the thing with feathers” – grew that these verses would wing outward, that the gesture would not only make more people aware of The Writers Circle (I am a businesswoman as well as a writer, after all), but also help imbue April 26 for everyone who carries these words in their pockets with the power of poetry.